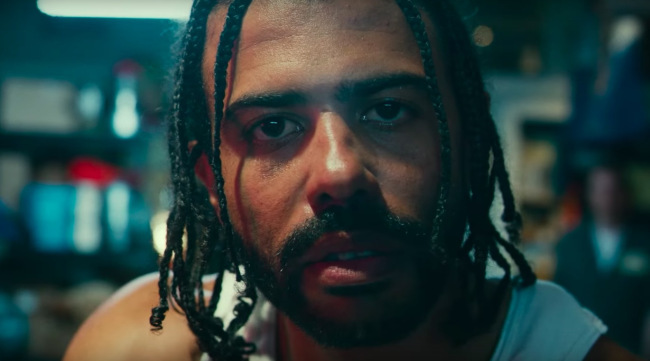 If you're like me and have never taken Daveed Diggs seriously as an actor outside of his Hamilton stage breakthrough, that's about to change with the powerful, confrontational drama Blindspotting. The strength of Diggs' spoken word lyricism, along with that of his longtime friend, co-writer, and star Rafael Casal, carries a film that captures every ounce of frustration at cops who persist in killing unarmed black men, at a white society that co-opts black culture but never has to deal with the daily fears of being black. 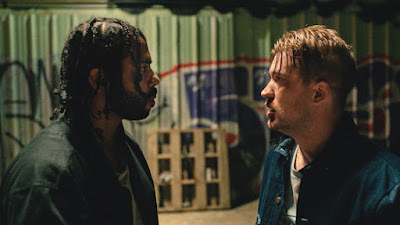 Blindspotting is a movie with something important to say and it pulls no punches in saying it, but thankfully it's also very funny when the messaging stops. Directed by Carlos López Estrada in his feature debut, the film follows two Oakland buddies trying to keep their head up in newly gentrified Oakland, where hipsters are so prevalent they're accidentally being set on fire by fruity alcoholic drinks. It's a long story, but one that landed Collin on probation for a solid year. Now with just three days until freedom, Collin is trying his best to stay out of trouble, and would probably have no problem if it wasn't for his childhood pal Miles (Casal), a white guy with grills in his mouth, a gangsta attitude, a quick tempter, and a gift of gab. Miles can sell anything if you give him enough time. A basket full of old curling irons? Bet. Sold to the nearby hair salon. A rundown old boat from a home he and Collin just helped empty out in their job as movers? Bet. Sold to somebody right in the middle of the street. A lot of the film's humor comes from Miles, whose mouth runs a mile a minute, even to his wife and kid back at home. And he's even sold something to Collin, that something being that his violent way is how one needs to be to stay true in the new Oakland. Collin starts seeing things differently when he witnesses an unarmed black man's murder at the hands of a white cop (Ethan Embry), recognizing that it could happen to any black man whether they're guilty of anything or not. Haunted by fevered visions, he starts to try and change his life and impress his ex-girlfriend Val (Janina Gavankar), first by getting healthy but also by changing his attitude. Unfortunately, there's Miles always pulling them into some new mess to get out of, like waving a gun around in public ("Plausible deniability!!!" Collin often cries) or starting fights at a hipster party. Diggs and Casal let their knack for wordplay fly in the everyday interactions between Collin and Miles, bursting out into rap at a moment's notice. At first it just seems like the playful exchanges between friends, but it begins to take a deeper meaning as Collin slips into rap to express his anger and rage. There are two major confrontations in this movie and in both Diggs is a force of a nature, dropping verbal dimes in monologues that are the backbone of the entire story. If Diggs doesn't bring it, the whole thing collapses, particularly in the final confrontation where his lyricism could be a distraction. 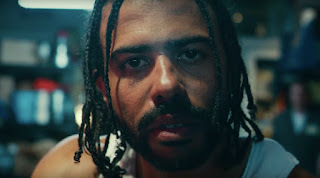 Instead he nails it, and that intensity he brings elevates Blindspotting during a directionless second act that plays like a poor man's Friday, with Collin as Craig and Miles as Smoky. Even then there are moments of inspired humor, and the chemistry between Diggs and Casal is something to witness. If the film gets a little preachy and overwrought, you can tell it's only because of how deeply Diggs feels what he's saying. The title Blindspotting comes from those illusory images where someone might see one thing, and another person something else entirely. If you've seen the image of the vase that can also be two faces, well that example is used here in the movie to visualize the effect. Here's hoping that people don't look at Blindspotting and see just another urban comedy with a message. There's more; there's the pure straight-up emotional potency Daveed Diggs brings, and it demands to be seen.